On November 28, 2018 Bishop Ryan hosted an open house for the next generation of Celt-X students and their parents! Well actually, it was Grade 8 Night, when our district elementary schools Grade 8 students and families come to see what our high school has to offer! Our robot, Oscar, naturally wowed the crowd. 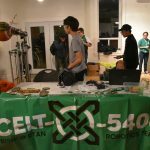 Celt-X Robotics is a high school robotics team from Hamilton Ontario. We build 120lb robots that play team games on a basketball sized court.